Sometimes, getting work finished feels impossible. You want to get more done, but you just need a little help. Where are you to turn? 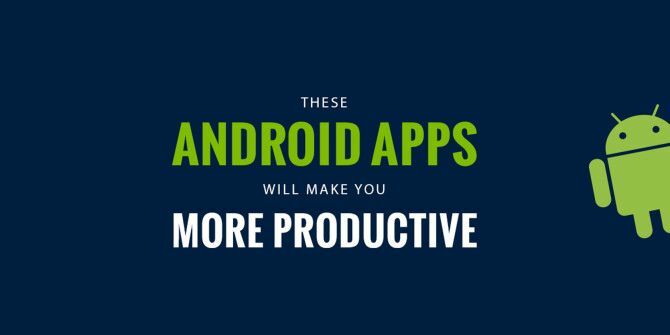 Check out this quick and handy guide that shows you some of the coolest productivity apps available on Android. Save it, so whenever you feel like your workflow 3 Smart Chrome Extensions to Speed Up Your Workflow 3 Smart Chrome Extensions to Speed Up Your Workflow Chrome's minimalist and user-friendly interface is a big reason for its popularity, along with the excellent extensions available in the Web store. Here are three that will make browsing easier for you. Read More needs a change, you can pull it out in a pinch! Want more on productivity 5 Habits Farmers Have That Can Boost Your Own Productivity 5 Habits Farmers Have That Can Boost Your Own Productivity Learning how to grow your level of efficiency from generations of men and women who grow things will teach you how to stick to your deadlines no matter what. Read More ? Check out our whole Self Improvement section which will provide you with all kinds of tools and skills you can use to work smarter. While you’re at it, don’t forget the Android section that covers everything from the hottest devices to the newest apps!